In recent years, paramount demands for new products have incurred more product development activities. Among the various stages of product lifecycle, manufacturing processes are energy intensive making the stage one of the primary energy consumption and carbon footprint sources. Effective implementation of manufacturing sustainability and eco-design technologies is increasingly prevalent for companies. The lack of effective, efficient, knowledge-based intelligent services to evaluate, simulate, plan and optimise manufacturing energy consumption and carbon emission during design and manufacturing planning is a major barrier crippling both large Original Equipment Manufacturers (OEMs) and Small and Medium-sized Enterprises (SMEs) to implement sustainability fully. 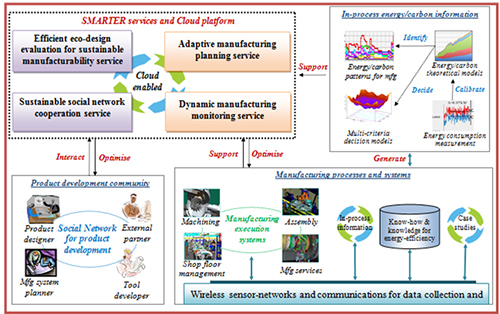 It is timely to develop and deploy Information and Communication Technologies (ICT)-embedded intelligent services for product developers/manufacturers. Objective 3: To showcase as real-world shop-floor demonstrators deployed in various venues of European industries and research institutes for technical demonstration, promotion and adoption; and to organise knowledge sharing and outreach activities for relevant communities and stakeholders in wider regions of the EU to increase the awareness of the project outcomes and to exploit the proposed solutions in order for EU manufacturers to shift towards sustainability efficiently. The project Consortium is comprised of 8 partners (3 research universities, 1 research centre, 1 multi-national manufacturing company, 1 large energy/carbon technical consultancy company, and 2 SME companies related to manufacturing simulation and energy/carbon-related product development) from 4 European countries (UK, Sweden, Germany and Spain). The complementary expertise of the academic and industrial European partners in the project enables effective knowledge sharing, dissemination and exploitation of scientific and technical know-how, findings, and industrial applications across the EU.